↑ Summers, K.; Cronin, T.W. ; Kennedy, T. (2003). "Variation in spectral reflectance among population of Dendrobates pumilio, the strawberry poison frog, in the Bocas del Toro Archipelago, Panama". Journal of Biogeography. 30: 35–53. doi:10.1046/j.1365-2699.2003.00795.x. ↑ Savage, J. M. 2002. 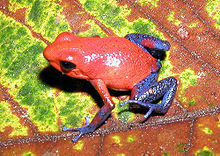 The Amphibians and Reptiles of Costa Rica. University of Chicago Press, Chicago and London. ↑ "สารคดี: MYSTERIES OF EVOLUTION:TWO FACED JANUS,POISON, THE". ช่อง 7. 22 January 2016. สืบค้นเมื่อ 22 January 2016. หน้านี้แก้ไขล่าสุดเมื่อวันที่ 22 มกราคม 2559 เวลา 17:41 น.